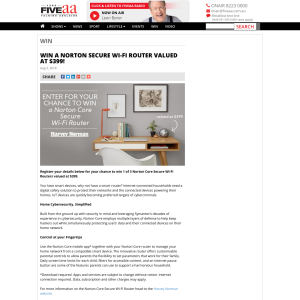 Register your details below for your chance to win 1 of 3 Norton Core Secure Wi-Fi Routers valued at $399. You have smart devices, why not have a smart router? Internet-connected households need a digital safety solution to protect their networks and the connected devices powering their homes. IoT devices are quickly becoming preferred targets of cybercriminals. Use the Norton Core mobile app* together with your Norton Core router to manage your home network from a compatible smart device. The innovative router offers customisable parental controls to allow parents the flexibility to set parameters that work for their family. Daily screen time limits for each child, filters for accessible content, and an internet pause button are some of the features parents can use to support a harmonious household. *Download required. Apps and services are subject to change without notice. Internet connection required. Data, subscription and other charges may apply. September 2018 at the Promoter’s premises.